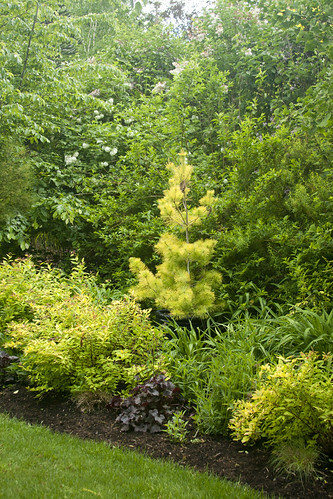 Rhone Street Gardens: A Spring Visit to Wind Dancer! A Spring Visit to Wind Dancer! As you may remember last fall, I announced (very sadly) that Wind Dancer Gardens was closing. As luck would have it, however, Heather and I spotted the owner, Caroly Kolb, at a recent plant sale. It turns out that she still had stock available, and she graciously invited us to stop by and shop our hearts out! I was so excited, I practically skipped all the way home. Ok, not really, we were in Canby, that's a LONG way to skip, especially weighted down with plants! Via the magic of Facebook, I invited some fellow gardeners in the Portland area to attend our little shopping trip, and so, a few weeks a go, we embarked down to Salem to visit Carolyn and her husband. 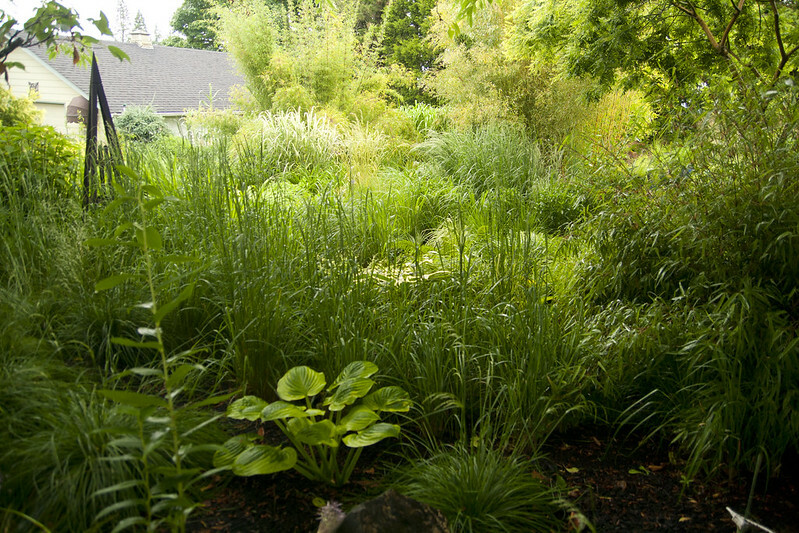 One of the best parts of Visiting Wind Dancer is getting to see Carolyn's garden...which is amazing. Of course, Carolyn is super-sweet, and the most gracious of hostesses, giving us a tour all around her garden, pointing out prized specimens and answering our questions. While most of the grasses are still growing into their glory, this spring time visit let me really appreciate all the other plants of the garden. 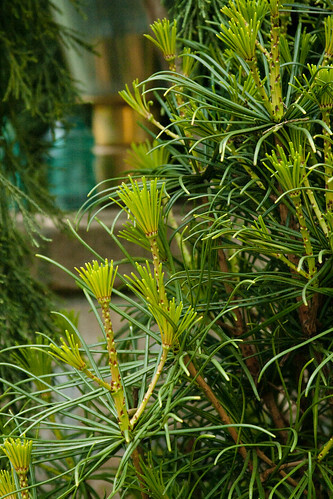 I don't think I've ever realized how many wonderful conifers Carolyn has...and I'm such a shrub and tree noob, that it's like discovering new plants to me! 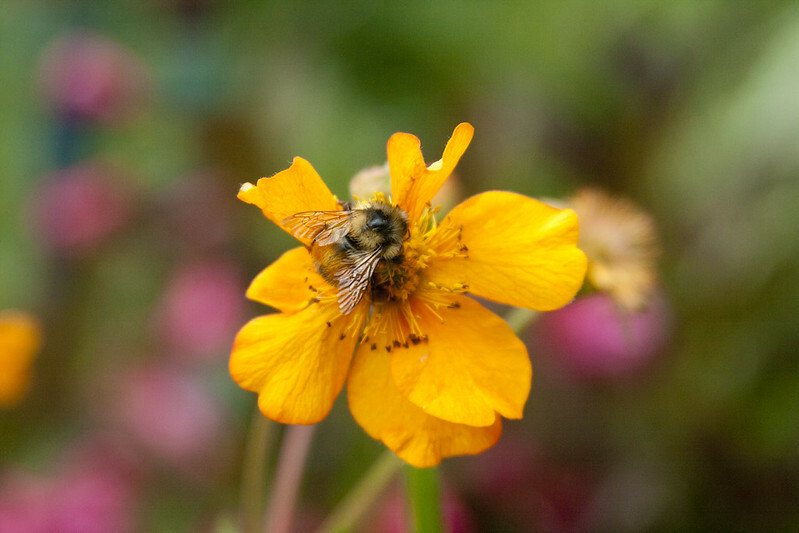 Don't you love the glowing color of this Geum...the bees certainly did! 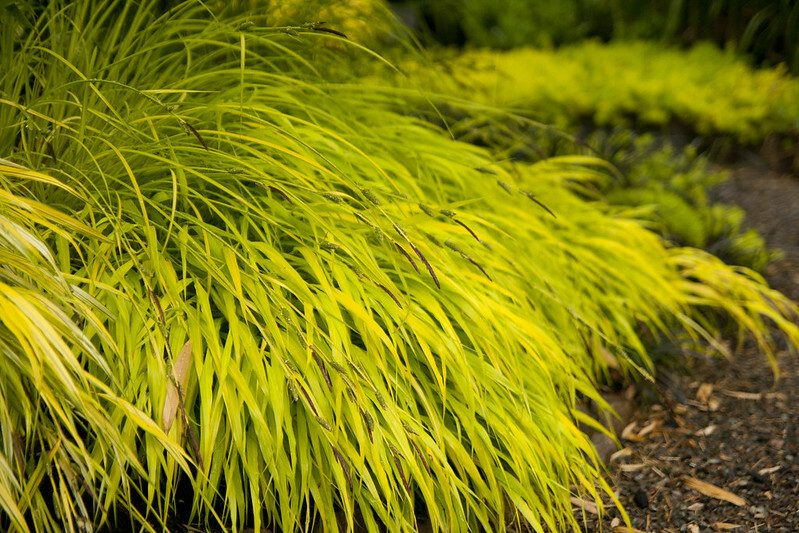 The wonderful Deschampsias were just starting to bloom. 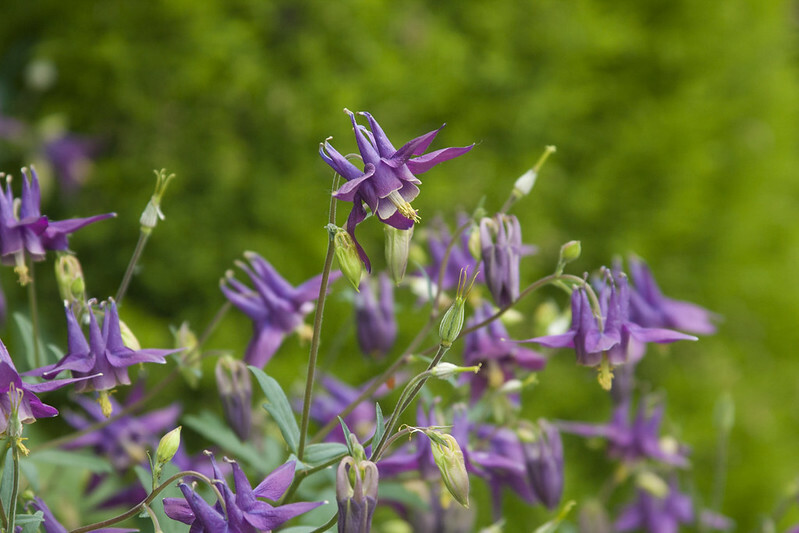 I love me some Columbines...and Carolyn has scads! I was uber-jealous of how enormous Carolyn's Lilies were...they were so much taller than mine at home...what's her secret (hint, I suspect magic is involved)! 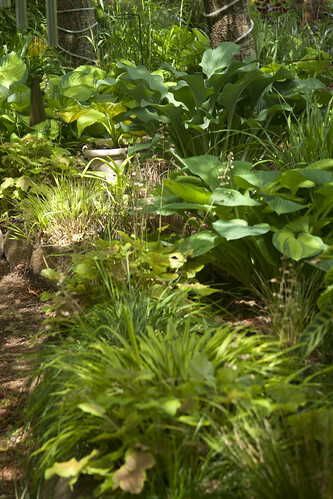 Part of Carolyn's front display garden has this wonderful, open shade that is perfect for Hostas, Carex and shade-tolerant grasses...I absolutely love it...it's like an idealized wooded glade. Divinely golden Carex starting to bloom. This wonderful Millium was erupting with blooms! 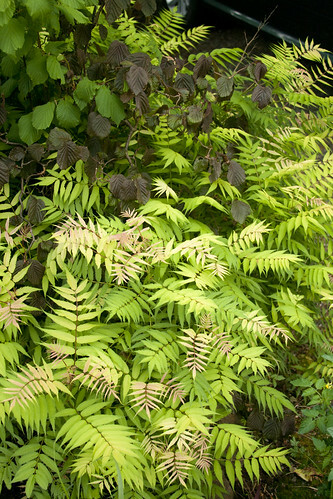 The plant on the left totally stumped me...but it turns out it is a form of Tiger Lily...although it looks totally different than the common Lilium lancifolium I have in my garden...I must research this more! 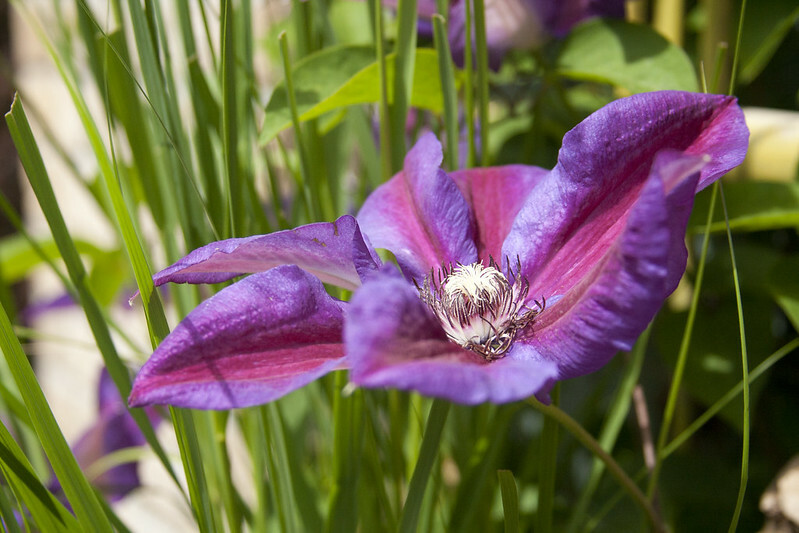 This picture really does not do justice to the intense coloration of this Clematis. I've tried and tried to grow this Poppy from seed ('Patty's Plum'), but to no avail! Look at those rich, crepe-paper petals unfurling! I know that I've noticed Carolyn's succulent/agave collection before...but with Loree along, it was like seeing it for the first time! Carolyn says she brings most of these into the greenhouse each winter. I love how Carolyn has added pieces of sculpture and artwork around the garden...each time I visit, I "discover" something new! Sigh...in my dreams, THIS is what my garden would look like! Oh...but back to business...there are plants to buy! 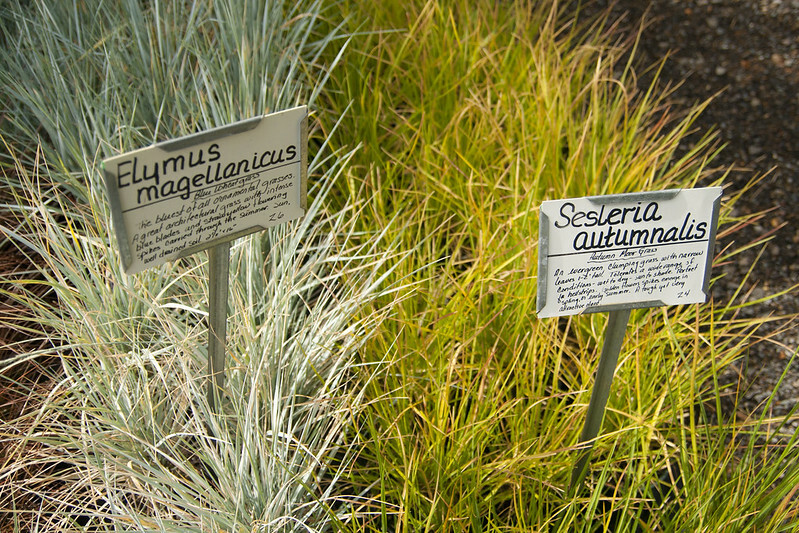 I seriously wish I had a large space left to plant...I really want a mass of Sesleria autumnalis....oh well...maybe in my next (MUCH BIGGER) garden, right? It seems I am ever drawn to the allure of the Moor Grasses (Molinia). We shopped, shopped, and shopped some more...and at the end, here's our group (minus Linda and Phillip, who had to leave earlier). From left to right, Heather, Moi, Loree and Jenni. And here we have (part of) my haul! I got several Panicum 'Cheyenne Sky', Molinia 'Strahlenquelle', Sesleria autumnalis and Pennisetum macrourum 'White Lancer'. Believe it or not, I've planted almost everything already! 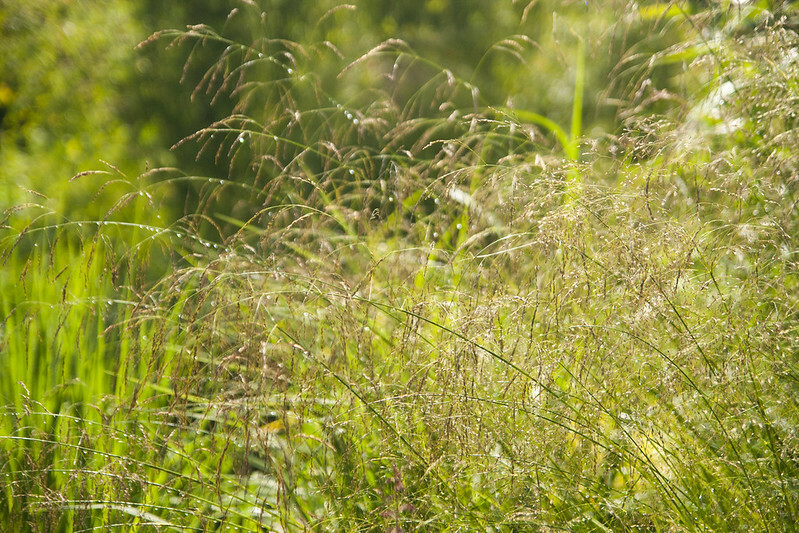 Carolyn still has a good amount of wonderful grasses left, so check out her website HERE. She's open by appointment only...so get out there before it's gone! Also, Carolyn has started her own garden coaching business, and, having seen her garden in person multiple times, I cannot think of anyone I'd rather have designing a garden for me! 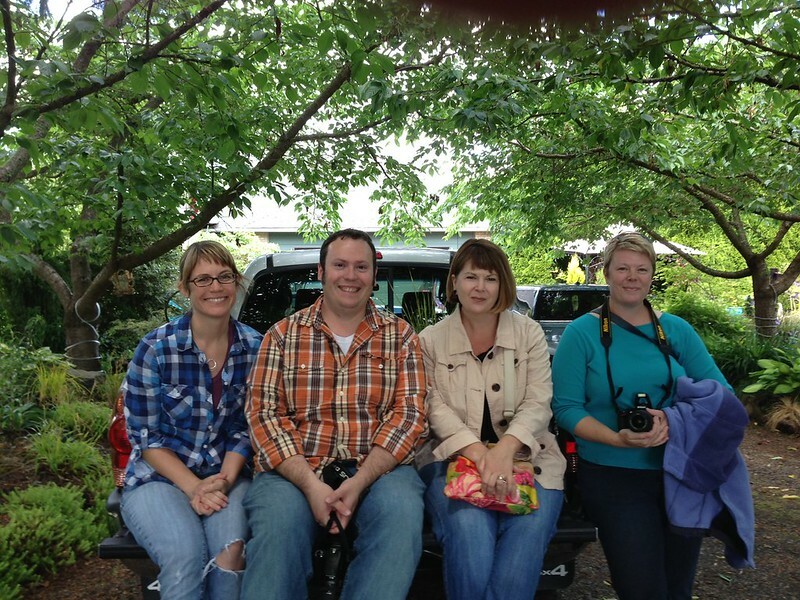 And lastly, in case you happen to be in the Portland area the weekend of June 8th, several of us Portland garden bloggers (myself, Heather, Loree, Jane and Ann) are giving a class on blogging at Joy Creek Nursery (info HERE). Do drop by, if you can, we'd love to see you (also, they have cookies). What sort of things would you like to have known when you first started blogging...what do you wish someone had told you? My grasses are sort of on hold at the moment; I got myself some lovely Pennisetum macrourum but haven't planted it yet because I plan on moving and really don't want to leave it behind. So I'm in two minds whether to leave it in its pots or actually get it in the border! Oh yes, I can imagine, it would be so hard, the idea of planting something, just to dig it up again in such a short time...good luck with the move!!! 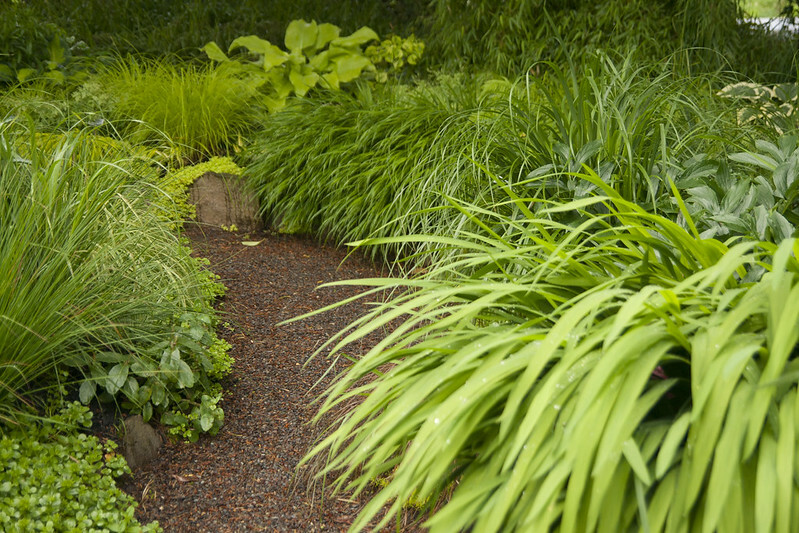 I know you LOVE grasses (with good reason), but remember to save space for some larger-leaved plants for textural contrast! You totally need to take a trip to Portland, Alan, we could tear up the nurseries! Lovely place, when I read the title of the post I immediately thought 'but hasn't the place closed?' because I still remember your disappointment when you learn it. I've been a little disappointed by molinias and sesleria autumnal is too lately. 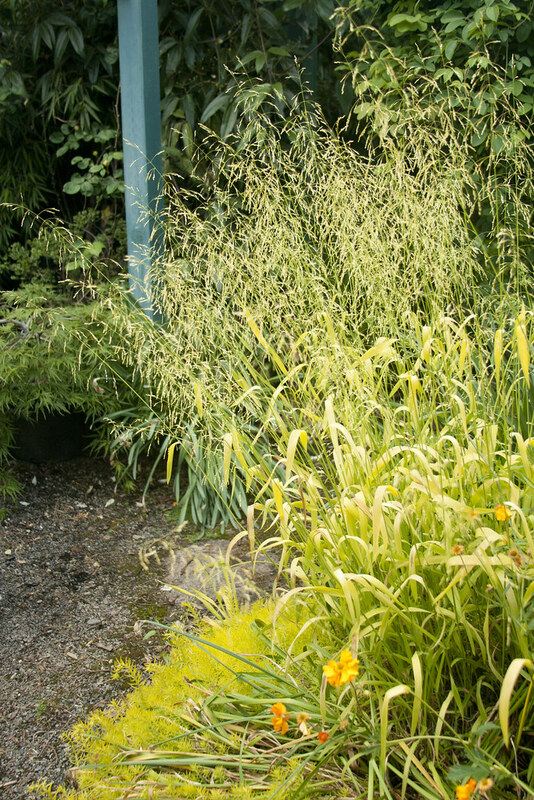 I bought some different molinia and I think it is very slow and fussy to establish but when it does it is a wonderful grass (I have m.arundinacea 'Transparent', 2mt tall, well established, other varieties are barely dead). 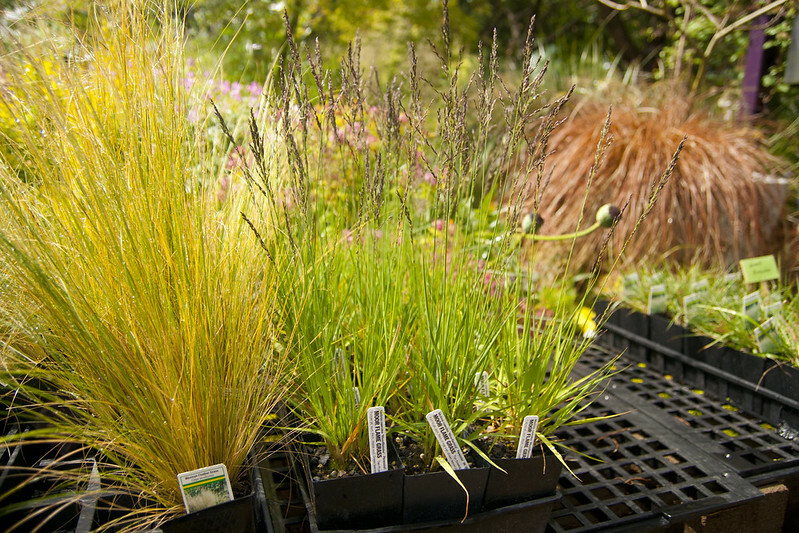 When I've seen sesleria autumnalis used on a Piet Oudolf project (don't remember which one though) I thought I wanted a drift too, so I bought 5 plants to put in the square bed. It's nice but not as much as I hoped. Anyway you might be luckier than me with your climate so don't despair! I agree, Ablerto...Molinias are slow to really establish...they really seem to need 2 or 3 years to get their acts together...and as for Sesleria...I think you really need a large amount to make an impact, they are somewhat small. Absolutely beautiful gardens. I always hate to hear about nice people like this having lost their business though. Thanks for the tour and great photos. It really is sad, Cher...and I still wish they would re-open for good! A stunning garden indeed! 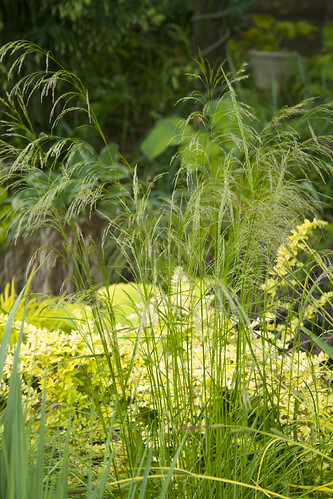 I think that ornamental grasses continue to be underrated, undervalued and underused. Thank you for posting these beautiful photos. 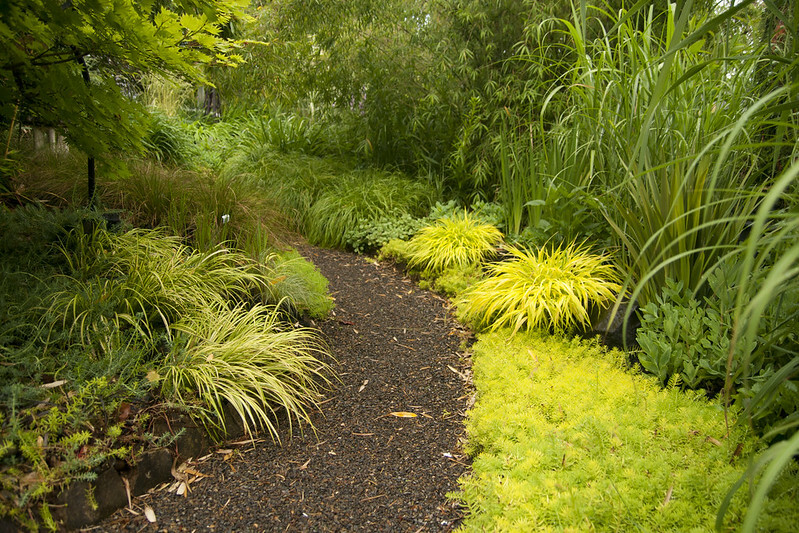 It's so true, Gerhard, grasses are still underused in the PNW...and the varieties available in most nurseries is so limited that I think there is a bit of "fatigue" of the same varieties. That was what made Wind Dancer so great...exposure to a much wider world of possibilities! 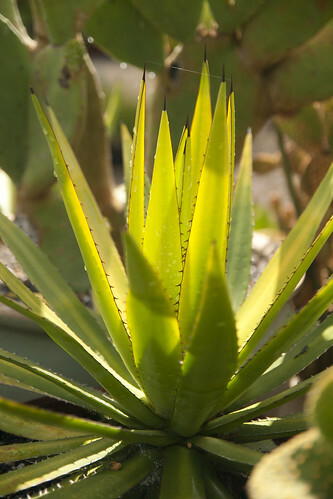 Have an opinion or an interest, or a point of view (like you developing your challenging small spaces, or Loree's spiky plants, or Heather's renovations etc.) Just random pictures of flowers will bore the blogger and never connect with an audience. Post frequently. If you let long stretches go by you lose momentum and end up with posts that feel like a chore, like "sorry I haven't posted in a while I've been busy". Post a lot, and the thoughts and pictures will flow. 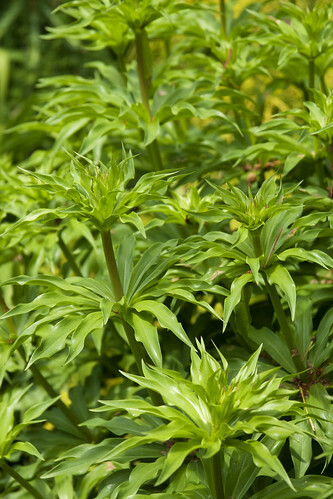 Name the plants in your pictures and identify where you are. Posts don't have to be plant tutorials (in fact bloggers ask for help and IDs and design input) and your location can be anonymous, but garden readers want to know pretty specifically what they are looking at and generally the climate where the stuff grows. 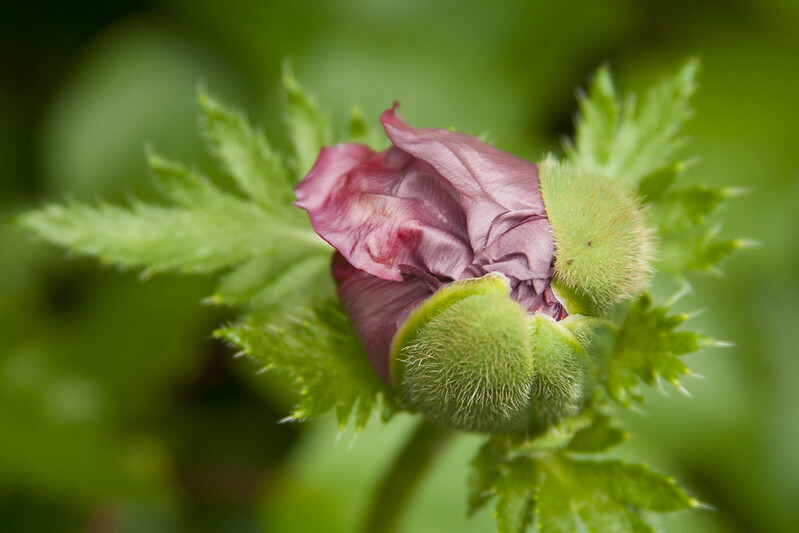 I know you will have lots of good ideas to teach about garden blogging (wish there could be a transcript) -- it is such a great community and finding other people online with the same interests and passions was an absolute eye opener to me. Good luck with the class! I too wish I was not so far away from Portland so that I could attend your blogging lecture. I am considering starting a blog showcasing the complete removal of my front lawn and planting all perennials that require low water. The design was created by Jocelyn Chilvers (I'm a big fan of her work). I live in Wyoming and there really are no "active" gardening blogs. There are a few that have strayed into general interest Wyoming topics, but they don't interest gardeners. Alan at INWIG has given me ideas too. Anyway, all your posts are inspiring. Thank you for what you do. Yes...love those suggestions, Laurrie...I've got them noted now :-) I think you're so right in that discipline in posting regularly is so vital...it's so easy to lose steam and focus! Chey...Good luck on your new blog...let me know the address when you have it up and running! Chey Design Guy, leave a comment to let us know when you start your blog. I am a long time Wyoming fan (annual visits to Buffalo) and would love to see a real gardening blog centered in WY! I think we should have a sit-down with Carolyn sometime to find out how much start up money she needed so we can open a grass nursery together. You can design the display gardens and I'll dig the holes! OMG, that would, truly, be amazing! 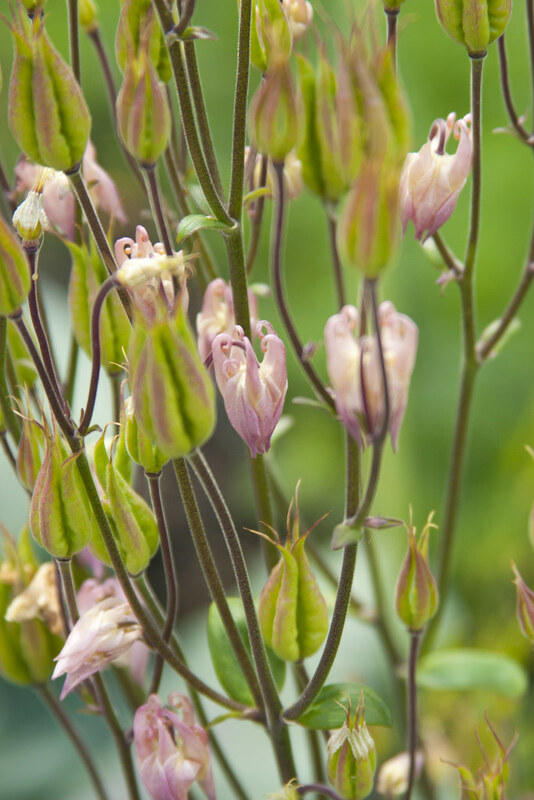 It's nice to read your take on your group visit to Carolyn's garden which is fabulous! And good luck with the workshop, wish it was possible for us to attend. Thanks for the vote of confidence, guys...I'm more than a little nervous! I'm still dreaming about that Tiger Lily "shrub"...so fabulous and unusual! Thanks again for organizing the outing and allowing me to tag along. How fortunate that you ran into Carolyn. Her garden is a showplace and I love your photos. 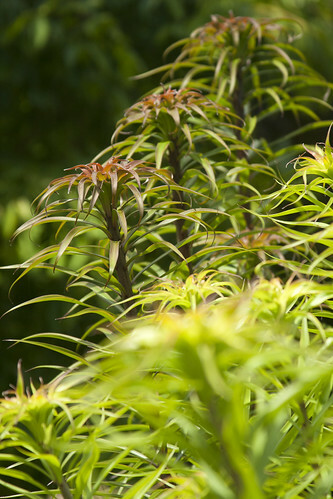 And what could be better than your own private plant sale? Any chance someone will video the blogging class? How wonderful that you were able to make one last shopping trip to this nursery. They have many, many wonderful plants. I would love to attend your workshop were I not 2,000 miles away. But if you need to get rid of any leftover cookies, I am accepting care packages. So, you've booked these folks for 2014 Fling ,right ? It's pretty far afield for us to all go to...maybe as one of the optional "shoulder" days! 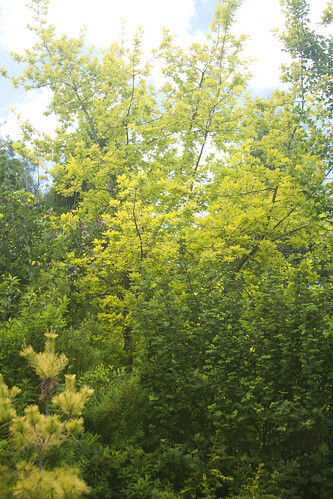 The path through the golden plants would cause me to want to live among that. One thing that stands out to me, is that with the gray look to the day, the way the golden-tinged plants were included or at least show up, brightens it all up as if it were sunny. 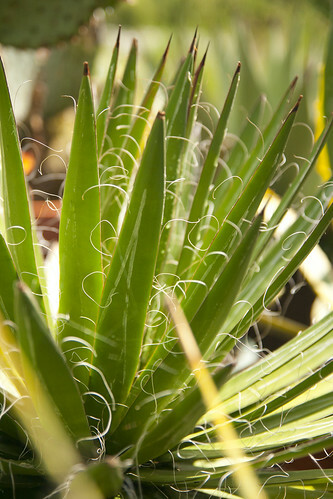 And thanks especially for the agaves! Scott I would go crazy in a place like that with all of those plants to choose from. I just finished reading Piet Oudolf's newest book called Planting, sure I will read it many more times to understand his combinations. OMG, Eileen, isn't that book amazing! Yes, I wil have to read it several times to wrap my head around everything! It actually held off raining and was pretty sunny that day, Grace...sunny enough for me to be too warm later and wish for clouds again! I'll email you now, Theresa! 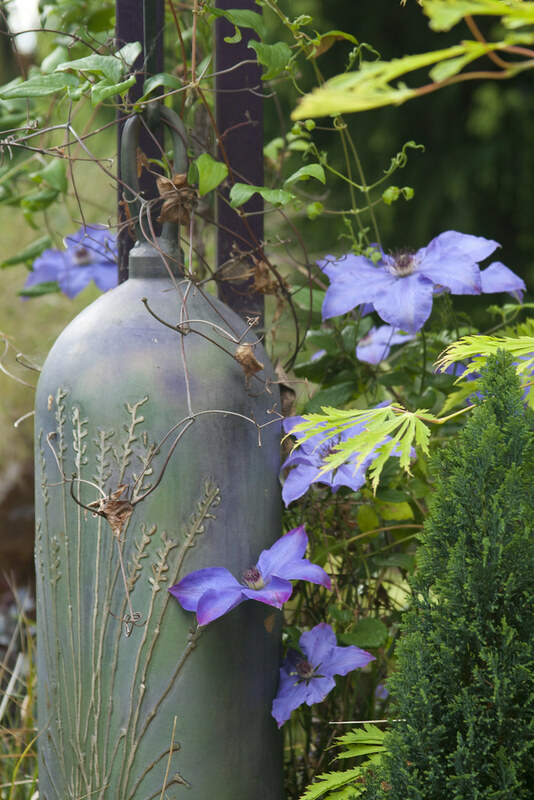 She has some gorgeous Clematis, Gail...amazing! The more I see of this garden the more I love it...seeing it from several bloggers' viewpoints is a great way to go. Hope to see you at Joy Creek, if R hasn't cooked up something else. I hope you make it, Ricki! Lovely tour of a beautiful garden. I remember when you posted about their closing so it's nice to see things are going well there. Wonderful plants and photos too. That will a great class on the 8th, wish I could see it. A lot of new bloggers drop off quickly so there are challenges in developing the commitment and consistency to build an audience. Choose and area or niche you enjoy writing about, but don't be too narrow or you will run out of ideas. Be prepared to take lots of field trips and thousands more photos than before. Read other blogs and comment because what you give to the blogging community will be rewarded in turn. Thanks for your input, Shirley...that's such a good point about finding your niche...or, your "voice". I wonder what mine is?!? Your photos are amazing, Scott. Thank you for taking us along on the tour of such an amazing garden! Glad you like the tour! You guys have such a great group of local bloggers! (Like Austin - yay!) I love that group picture of you guys. Glad you had a great touring/shopping day at Wind Dancer. 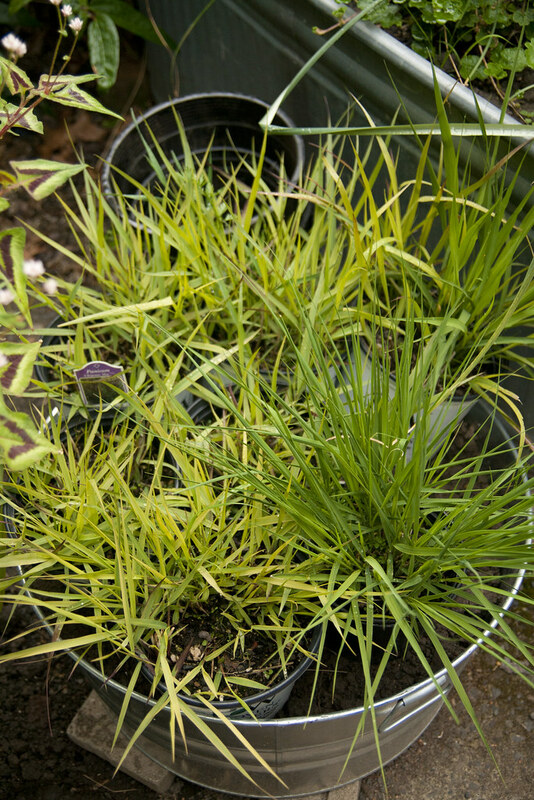 I have been coveting some gold carex for some time now, and finally picked up three 'Banana Boat', planted them, and then found out the species was not evergreen here. Oh well, more research needed next time. was super long) soo I guess I'll just sum it up whhat I submitted and say, I'm thoroughly enjoying your blog. I as well am an aspiring blog blogvger but I'm still nnew to the whole thing.